Protein Plus Low Carb Bar is suitable for those following a low carbohydrate diet. Low carbohydrate content and high fibre, with the addition of vitamins and minerals. Each bar is 35g. Do not exceed one bar per day. Bulking agent: polydextrose syrup, maltitol chocolate (maltitol, cocoa butter, milk powder, cacoa mass, emulsifier: soya lecithin, flavouring), milk protein, vegetable fat, skimmned milk powder, inulin, maltitol syrup (from wheat), humectant: glycerol, calcium carbonate, magnesium carbonate, vitamins (niacin vitamin E, vitamin B6, riboflavin, thiamin), flavouring, emulsifier: soya lecithin, sweetener: sucralose. Traces: Gluten, peanuts, nuts, soya protein. Excessive consumption may induce laxative effects. 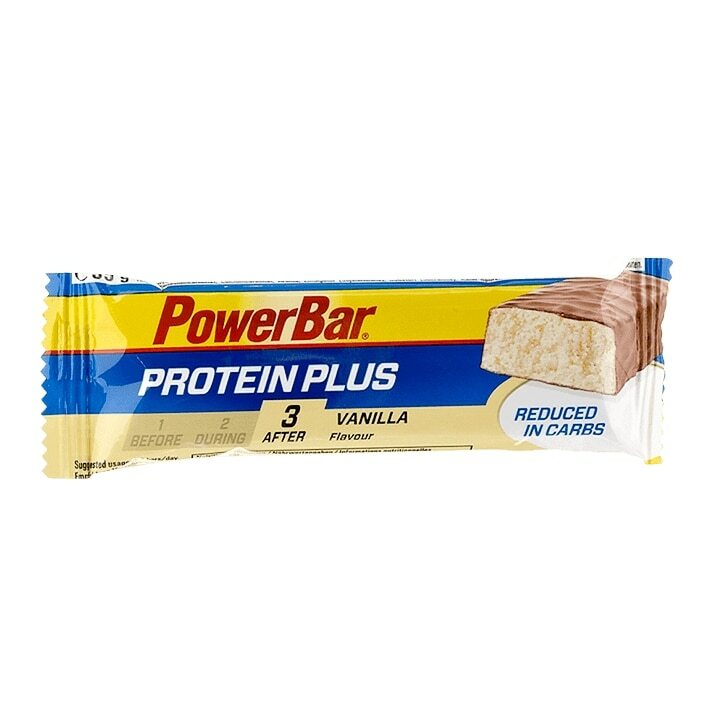 Powerbar ProteinPlus Low Carb Bar Vanilla is rated 4.7 out of 5 by 3. Rated 5 out of 5 by Horselover2344 from Very Tasty Really nice bar, hit the spot, an ideal bar for after exercise, definitely will buy more in the future.